Finish of your summer at a spectacular celebration of samurai pirate culture on the beach. 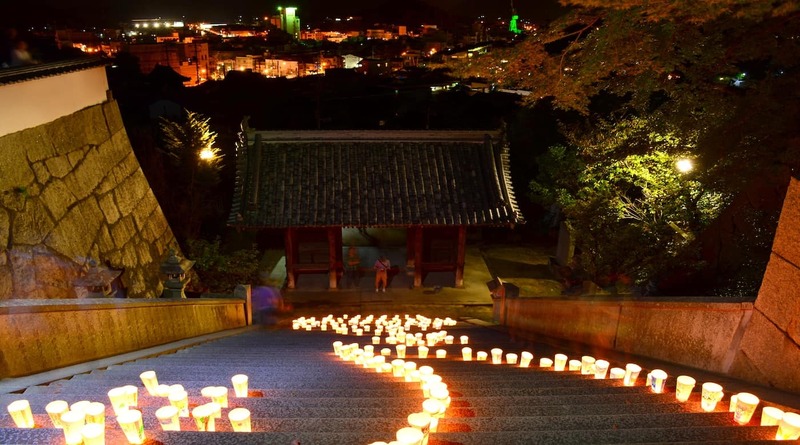 On an autumn evening every October, people flock to Onomichi to wander its picturesque streets decorated with thousands of candles. Scenes from the annual celebratory kangetsu-sai autumn moon-viewing tea ceremonies at Hiroshima’s Shukkei-en Garden. Live music, handicrafts and cows! Steve Jarvis introduces a different kind of countryside fair in eastern Hiroshima prefecture. Gokoku Shrine’s annual tondo bonfire festival coincided with the biggest snowfall to hit the city in a generation. This tondo festival in Honkawa is a nice mix of shrine rite and neighborhood event. The annual “Flower and Light Pageant” illuminations at Hiroshima City Botanical Gardens are some the most Christmassy in the area.